Hello there. We are Red Lorry Yellow Lorry musical improv – affectionately known as the lorries. We’re a musical improvising group from London, we make everything up as we go along – turning audience suggestions into toe-tapping, rib-tickling musical comedy gold. We do shows, private parties and corporate events. 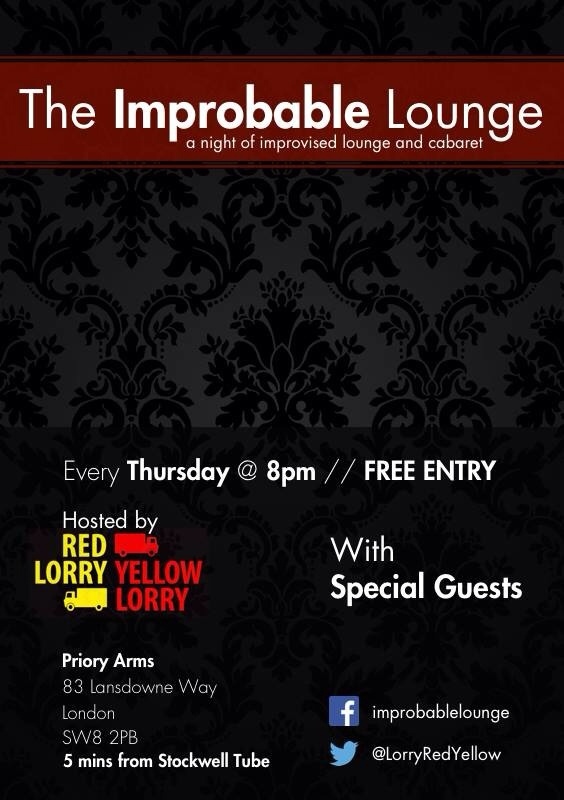 New for 2014 is our weekly London residency called the Improbable Lounge. As well as improvised cabaret tunes from us, you’ll find a selection of great cabaret, musical comedy, lounge & variety acts – cherry picked for your delight and wonder..
That’s on every Thursday at The Priory Arms, Lansdowne Road, Stockwell – 8pm start. And it’s free entry!